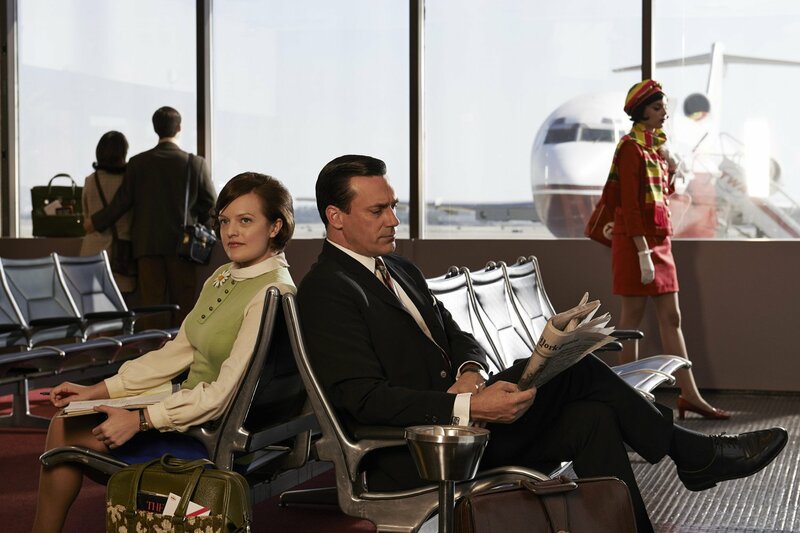 Jon Hamm and Elizabeth Moss star as Don Draper and Peggy Olson in AMC's "Mad Men." The enigma of Don Draper has attracted countless paragraphs of prevaricating think pieces and hours of discussion, little of which has done more than simply pose the question, “How can someone so manifestly flawed manage still to be so engaging, so likeable?” Though Jon Hamm’s work on “Mad Men” is certainly exceptional, to focus so single-mindedly on Don’s character is not only to miss a great deal of what is appealing about the show but also to ignore what ultimately makes him deserving of sympathy. Don is flawed and scared, and so is Peggy, but somehow, in these occasional moments when the viewer sees them alone, they are able to keep each other afloat. When Don dances with Peggy to “My Way” a few moments later, in one of the most lasting images of the season thus far, it is not quite paternal, nor is it quite romantic. There is simply some indescribable quality about Don and Peggy’s relationship that makes it somehow crucial, somehow perfect, despite each character’s manifest imperfections. And it is moreover perhaps this aspect of “Mad Men” that gives it so much stronger a sense of truth and reality than perhaps any other show has ever been able to achieve. Show creator Matthew Weiner understands how two human beings may come together to create something greater than themselves and how it is that something that grants them their humanity. Don is a character who can keep afloat a 7-season television show not because of any quality of his own but because of how he does, ultimately, care—for his children, for Megan, and, above all, for Peggy. When Don accepts the apparent end of his time at SC&P and has Peggy present to Burger Chef in his place so that at least she may advance her career, and when the two embrace in season seven episode seven when both Don’s position at the firm and the account are assured, they are both the best versions of themselves. “I worry about a lot of things, but I don’t worry about you,” Don tells Peggy in “The Strategy.” And why should he, when his regard for Peggy is the best part of himself. $300 per Hour Harvard Club Lawyer: "Workers Must Give Up 25% per Hour!" For its spring theatricals this year the Delta Upsilon will present "The Maid in the Mill," by Beaumont and Fletcher.